Well another day in the big freeze, I was doing my tax return today, so didn’t get out, however I hope that tomorrow I can get out again. Probably to Idwal, although I need a lift over there first. 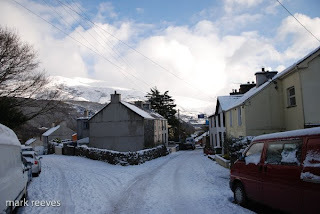 The picture was taken this morning at the top of Goodman Street Llanberis, and shows how hard the snow and ice has hit the villages around here. With the back streets being particularly bad for driving. I staggered down this road at about 10pm last night after a few drinks. I pretty much slide to the bottom, in a very drunk state. Well today I ventured out onto Sergeants Gully and Parsley Fern, it was a stunning day, probably one of the best I have ever had out on easy ice/snow gullys in North Wales. The weather was alpine. Blue Skies, no wind and freezing. Sergeants was in excellent condition although some of the upper falls were banked out with snow, and Parsley Fern gully that had been a swim on Saturday according to a friends was in much better condition, with the snow really starting to form decent neve. The Summit on Crib Y Drysgl was solid neve, and the view across at the Trinity face was unbelievable. I have never seen it look so good with not a single piece of rock visable as snow and rhime had turn the face totally white. Anyway, with the weather set to be cold all week, the chance of Central Ice Fall and Cascade coming into condition seems quite likely, as they were looking good today, with a few more days freeze, it will hopefully thicken up. I’ve watched with increasing disbelief the recent accounts of local rescues and I reckon some of the climbers should have been flogged and billed for the rescue! I’m trying to play a small part with our guests at (hotel, B&B, Bunkhouse) explaining about clothing, layers, proper footwear, telling people where they’re going, carrying a phone, drinks, Mars bars and so on. I’ve still had two lots of guest send up in Ysbyty Gwynedd and had to call mountain rescue for another group. Other guests have gone up in trainers and jeans and we’ve had two or three guests whose dog’s pads have been shredded on the Llanberis Pass by sharp slate. All this is leading to the fact I’m fed up with nagging and am looking for safety posters to put up in the accommodation. Does Llanberis M R have one? Do you have any other suggestions? Otherwise I need some good text and I’ll make my own. There was a avalanche today on Snowdon, at the top of the PYG track, fortunately no one was hurt, although two people were reportedly caught in the slip. There is a lot of Snow accumulating in the gully’s at the moment, as well as a strong breeze building up windslab. Baggy has some good info on where some of this build up is and might be, as well as a some more information about condition. If winter suffering is your bag. Remember at time no route is worth the risk. A climber was overheard today saying “We’ve come all the way from …(Insert somewhere a long way away)… we are going to climb it”. As this attitude might well end up kicking you back in the arse. Well, it had been a long festive season, finishing at 5am for me on New Years Day, in a total state. I rested yesterday, mainly in bed. I did make it down to look at the fresh snow starting to fall, and sat indoor when the Team was called out. Sorry I couldn’t make it but I was still a mess and 5pm, so thought I would only be a liability on the hill. There were two rescue that evening, and neither would have been very easy as the condition looked atrocious outside my window. I think I was tucked up in bed by the time both jobs concluded. Being the start of the new year and the end of poisoning myself with as much beer as possible. 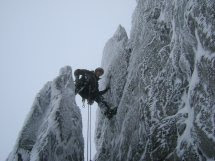 I decide to head out with a friend to try this ‘Winter Climbing’. I had put of going out up to now for a variety of reasons, weather and the fact that I think my subconscious remembers my previous winter climbing suffer fests. We were on the hill, at nine, and I sweated the alcohol out, a kind of extreme detox. We had hope to climb face route, but there were a couple of teams already on there way. So instead we headed up past sergeants gully, which looked a little damp and totally rammed. So instead we headed to the side of Crib Coch to climb Reade’s Route a V 6 mixed route. I had decided to go leashless, for the first time and I must confess to being not too good at mix climbing. Ice climbing I quite enjoy, but mixed climbing seems like climbing a rock route in really bad weather, and something I haven’t really got my head round. So arriving at the base, Simon asked if he could have the crux top pitch, to which I replied you can have the first pitch as well if you like. The first pitch was nice enough with interest through, with an awesome final crack to the belay. Which was strenuous, as the foot holds disappear so a few lock off later I had hooked and laybacked my way to victory, and despite the strong updraft and freezing weather I wasn’t cold yet, and I hadn’t got the hot aches. Brilliant!!! Brilliant my arse, the Hot Aches hit like a freight train on the belay, and I wanted to puke. As Simon left I looked up and sensed this might take some time, and the ice chilled winds blew sprindrift relentless up in my face whenever I tried to look down. I could barely see the first belay at the base of the route, let alone a view of any interest. 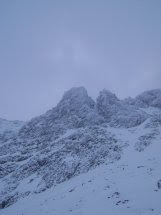 Above Simon battle, looking like a he was at home on tipped out on crampons and teetering on hook after hook. As I started to freeze, I remember Scotland. I remember why i find mixed climbing is less fun then sticking needles in my eyes, as I become chilled to the core. Despite literally thousands of pounds of the most hi-tec clothing the outdoor world has to offer I am still cold. I take this as a reason that there are some places that a person just isn’t supposed to be, and strapped to the side of a mountain, in sub zero blizzard is one of them. As I start seconding my hands that despite being well gloved are numb, and I perform some ineligant move to reach the top of the pinnacle, before starting a tenuous and dare I say it rewarding layback up to a niche. Where I fight to unwedge Simon’s Hex that he has cold welding in the crack. I give up as my hands can barely feel the axe as I grip hard. Above is the crux for me a series of reasonable hooks with what feels like tenuous moves to get between them. Sure I am off on more than one ocassion it is a battlefield to the top. Where with the added assistance of a tight rope for courage, I flop exhausted over the top, and instantly double over and start to dry retch. The hot aches this time are so bad that I am crying. The pain so bad I can barely untie from the rope. By the time Simon has rigged the abseil, I can speak again and the tears have dried. Its only as we start to walk down and the warmth returns to my body that I start to even remotely enjoy the situation. Even now sat at home finger tips still numb from the cold, I question my sanity, and that of many of my friends who actually seem to enjoy this type of thing. It was a a form of suffering that is probably illegal by the Geneva convention, from the long sweaty walk in to those aweful hot aches. Why on earth I keep going back for more I have no idea.